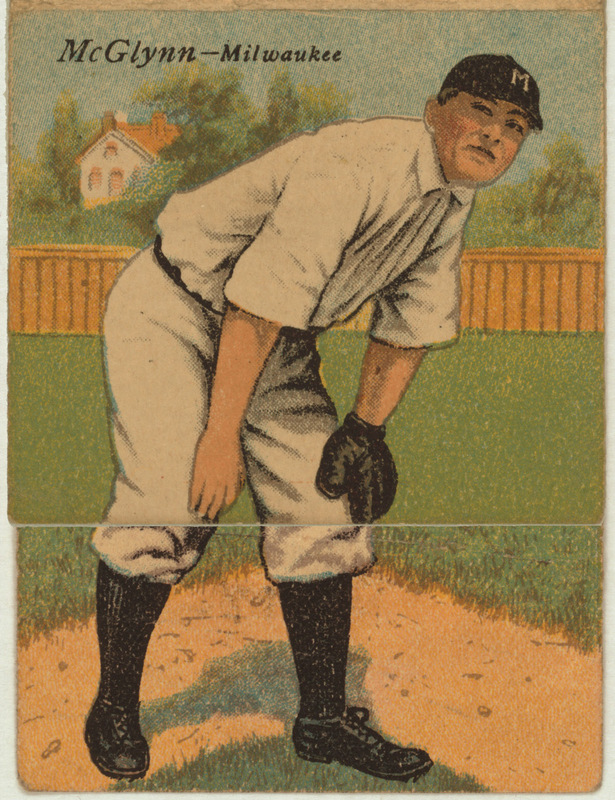 Today we examine a particular slice of Milwaukee baseball history, a tobacco card from 1911. It comes from a series of cards known as the "Double Folders", given away in packs of Mecca cigarettes and depicting a pair of players on every card. In later years, collector guides would designate these as "T201s". On one side of the card, a full-length portait of manager/center fielder Jimmy Barrett. Barrett had come to Milwaukee in 1909 following a ten-year career in the majors. He was a utility outfielder, appearing in an average of 64 games in his first two seasons, before earning a shot to manage the club as well. He lasted only one season at the helm before being replaced by Hugh Duffy, another single-year skipper who was himself replaced by Harry "Pep" Clark. Barrett's time with the Brews was brief, but just long enough to immortalized on this tobacco card. On the reverse of the card we find a three-quarter shot of right-handed hurler Ulysses Simpson Grant "Stoney" McGlynn, and stats for both men. McGlynn was a Brewer for the exact same three years as Barrett. He liked to tell the story of pitching relief in a game for the St. Louis Cardinals in 1907, when he retired the side without throwing a pitch, by picking off all three baserunners. His brief tenure in Milwaukee was nonetheless eventful, as he amassed records of 27-21, 16-21 and 22-15. In 1909 he set two league records—pitching 446 innings and hurling 14 consecutive shutouts—that were still standing at his death over 40 years later. When the top half of the card is folded over, McGlynn's torso meets with Barrett's legs, forming a complete picture and giving the "Double Folder" its name. Clever card designs. And such a bargain–two players in one.